As conditions in the energy and utility arena have changed, EEA executives have expanded their capabilities to address the sustainable solutions. To date, the EEA Team has completed over 150 major projects and has been successful in developing expanding energy and renewable projects. EEA have many years of diverse industry experience. The scope of the EEA team experience in design and construction, utility and energy studies, facility evaluation, energy efficiency design, and project management brings a depth of experience necessary to the manage complex energy projects. 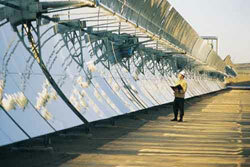 In particular, the EEA Team offers unique experience in analyzing renewable project needs for project financing, when budgets and capital funding are constrained. EEA has the in-house expertise for manage the critical services to help respond to the ongoing changes in the utility services industry. EEA serves as the agent enabling the client to control the destiny of the project, save substantial money, reduce frustration and minimize costs.